If you’ve bought a new TV lately, you’ve probably realized that the sound coming out of these new TV’s is usually pretty sub-par. This issue pretty much exists for almost all TV’s currently made, the physics of producing great sound from a tiny space just don’t work out. Luckily, new sound bars solve these problems and take sound to heights that used to cost a ton of money. I bought this Samsung HW-M450/ZA Soundbar to go with my LG 65UJ6200 TV. This Samsung Soundbar via Amazon affiliate below. Once you get the sound bar out of the box, it’s pretty easy to setup. You can either use an HDMI cable (ARC) or an optical cable to send the sound from your TV to your sound bar. Either one works really well, I tried them both out. 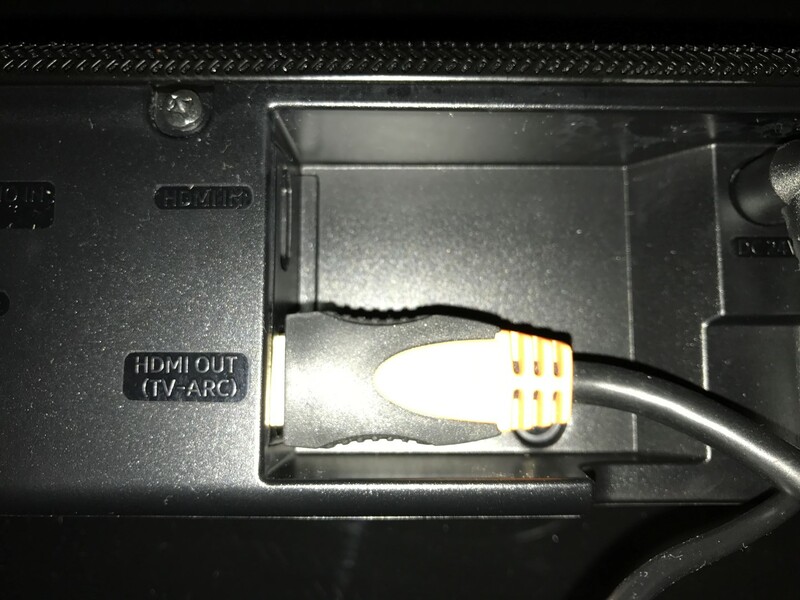 I would say that HDMI is the preferred method if your TV supports ARC (audio return channel) because generally things work better via that method (the TV and sound bar will communicate better). The optical output is a one way deal which can make it more difficult to keep working. I didn’t have any issues with either method for the most part but I did have a couple times where the optical connection didn’t respond right away. Once you have it connected, you can either leave it on a shelf or mount it to the wall. I’m currently on a shelf but have been thinking about mounting it to a wall. It comes with the two brackets necessary to hang it on the wall, which is nice. 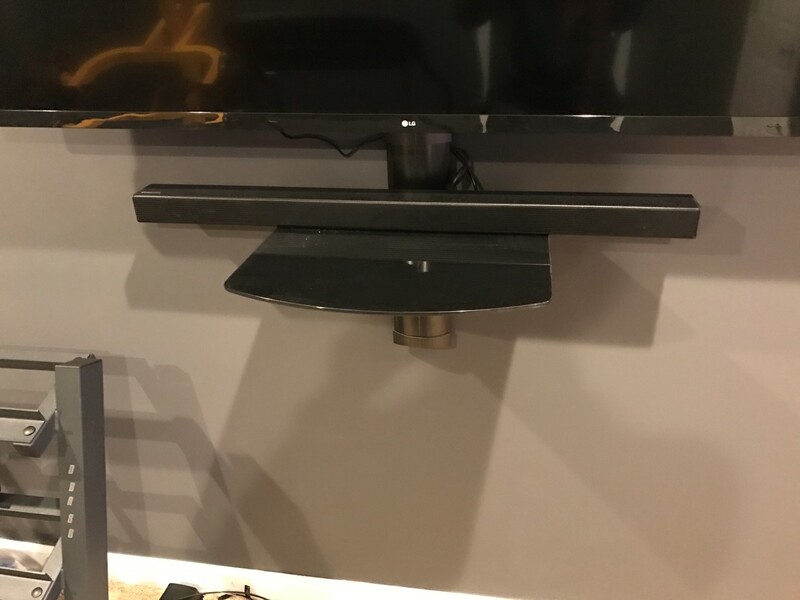 However, the brackets don’t stick out from the wall much, so if your TV wall mount isn’t super slim your TV will stick out in front of the sound bar quite a bit. The first thing I did was turn off my TV’s internal speakers. That way all sound would come from the sound bar instead of from the TV. On the LG TV I hooked the Samsung Soundbar to, the volume from the TV remote would control the volume to the Soundbar. That makes it extra nice because then you only need one remote to control everything. The Samsung remote is pretty basic. It allows you to control the sound modes, the subwoofer volume, and volume should you choose. The only feedback you get is through an LED display that comes on when you adjust the volume and settings. It works out pretty well once you figure it out, but it isn’t the easiest thing. Of course everyone wants to know, how does it sound? It sounds pretty good for the most part. Everything I’ve tried with it sounds pretty good. I have had a couple issues with some Xbox One games and character speech, for some reason a couple games have the dialog very soft in relation to other sounds which makes it a little hard to hear sometimes. That isn’t the soundbar’s fault though, just a game mixing issue. AC: Origins was one of the games in particular I had problems hearing the dialog. NBA 2k18 on the other hand was phenomenal with the sound bar, clearly the best sounding game on it. I’ve been very happy with the Samsung HW-M450/ZA soundbar so far. I put it in my workout room, and I’ve had people comment that it feels like a movie theater in there now with the TV and surround sound. I’ve really enjoyed the sound + TV when playing games while working out on my elliptical machine, makes the time go by pretty fast. The ability to add the rear speakers takes the soundbar to a different level in performance for not a whole lot more money.